The Spotted Trotter of Atlanta delivers only the best-tasting, highest quality meat sourced only from humanely-raised animals of local farms. "Kielbasa" is Polish for "sausage," and a variety of different styles exist. Most contain pork but some, like The Spotted Trotter's, are a mixture of beef and pork. Lamb, turkey, chicken and even veal kielbasa are also popular choices. Kielbasa is often flavored with cloves and other spices, garlic, pimento and herbs and then smoked (although it can also be purchased fresh). 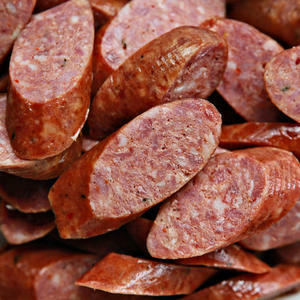 If smoked, kielbasa can be served hot or cold, and grilled, baked or boiled. Kielbasa is fabulous added into soups or stews, served with sauerkraut, or even sliced and served as a snack (popular with vodka in Poland!). We prefer to use The Spotted Trotter's kielbasa because this local company's meats are all-natural and from animals that are humanely-raised and hormone-free. The Spotted Trotter also uses organic herbs and produce when seasoning their meat.